Oil-Electric: Tick - Tick - Tick. Port Townsend, today. 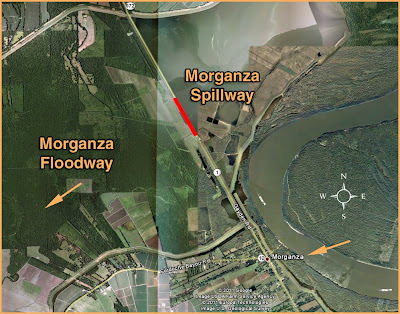 Morganza - a name thrust upon the International scene in the past few days, attached to a flood control structure, now playing a key role in the salvation of Baton Rouge and New Orleans Louisiana. Literally thousands of residents inside the floodway anxiously await the trigger that will send excess flow from the Mighty Mississippi through their farms and homes. And the clock is ticking. Morganza takes its named from "Morganza Plantation," the antebellum holding of Charles Morgan, an early surveyor, and political figure. Union troops burned the town of Morganza to the ground on October 1, 1863. Morganza Louisiana was one of the filming locations in the Hooper/Fonda epic, "Easy Rider." The story of what took place there between one whacked out Hooper and the local town folk, is located about half way down the narrative. It's worth the read! 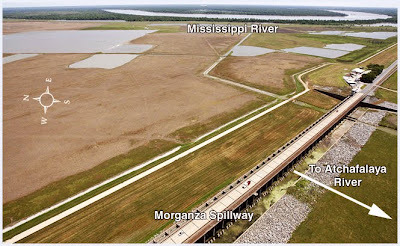 According to Col. Ed Fleming with the US Army Corps of Engineers, Morganza cannot open until the Mississippi River reaches a threshold of 1.5 million cubic feet of water per second. 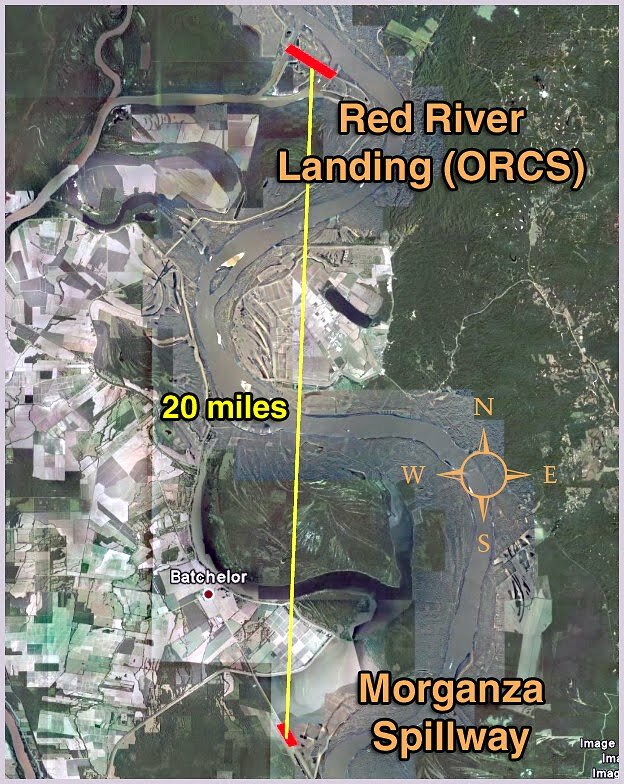 The measurement is taken at the Red River Landing Gauging Station, located about 20 miles north of the Morganza Structure, on the Missouri side of the river. 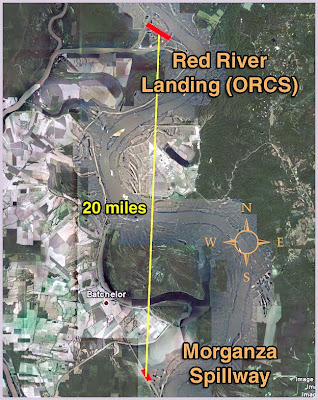 We better know Red River Landing as the ORCS - Old River Control Structure. This graphic will help you understand the flow rates at each structure. Water currently flowing through the ORCS is shown as "Old River" on the diagram. You can see Morganza flow rate as "0." Notice Bonnet Carre is running at 82%, with 212 of 350 bays open. 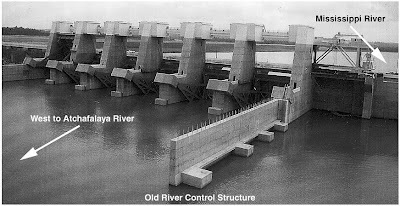 (Remember each bay had 20 "needles") And Old River - ORCS is flowing just under 100%. 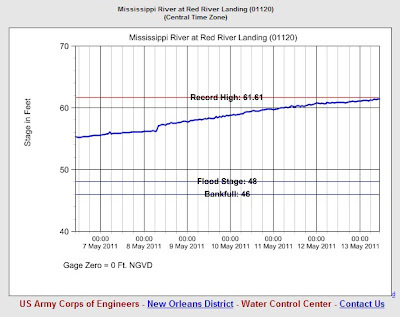 That is why there is already flooding taking place south along the Atchafalaya. You can "refresh" the graphic link to monitor water flow, at any time. Once that threshold is reached, half of the 125 gates of the spillway will be opened, funneling 300,000 cubic feet of water per second. 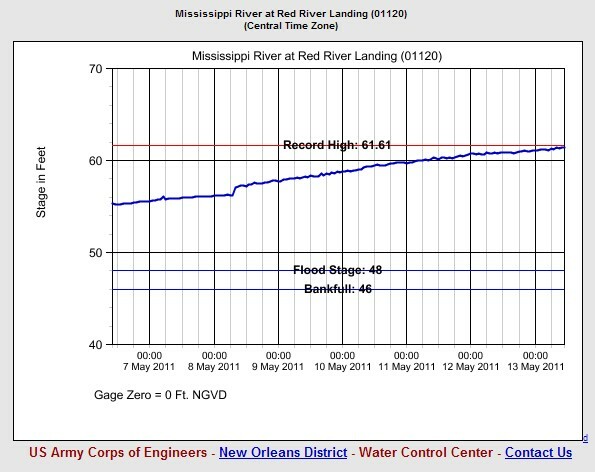 It will take just one day for the water to reach Krotz Springs and three days to reach Morgan City. I don't know about you, but I am having a heck of a time trying to visualize what 1.5 million cubic feet per second "looks" like. So I turned to the "World Data Base of Waterfalls." Niagara Falls averages only 100,000 cubic feet per second. Looking at the World Data Base of waterfalls, at the top of the list, Inga Falls in the Congo. 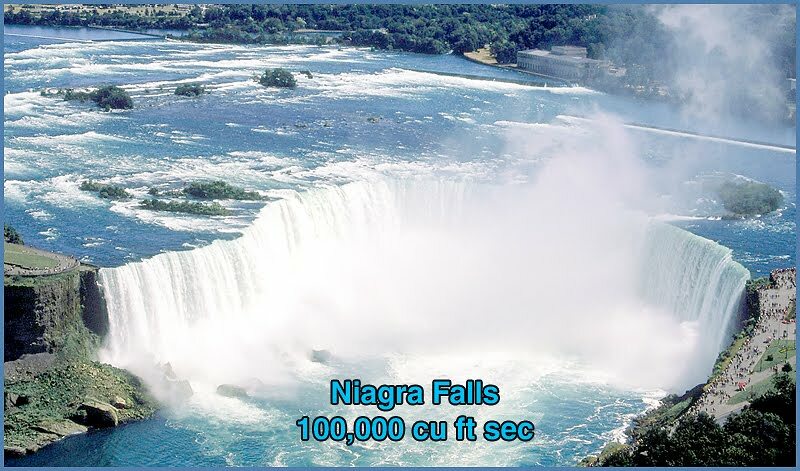 At medium discharge of 42,476 m³/s (1,500,000 ft³/s) it is arguably the largest waterfall in the world. So here is one of the rare photos of Inga Falls. Really looks more like rapids than a waterfall. But even though you can see there is a lot of water flowing, it is still incomprehensible to really grasp how much water that is.